The Colors Of Indian Cooking: Vegetables In Love, Peas and Mint! Soupy Sweeties. Vegetables In Love, Peas and Mint! Soupy Sweeties. Every now and then this thing gets stuck in my head and I can't shake it loose. Actually quite a few things get stuck there and a lot of the time its like living inside of a calliope. However, the particular thing I'm thinking of is this: "I eat my peas with honey, I've done it all my life. It makes the peas taste funny but it keeps them on my knife." I can't look at fresh peas without hearing that in my head. But of course, that's my problem. I love vegetables. I especially love vegetables that take a bit of work. Shelling, husking, peeling, you get the picture. This time of year, Sonoma is filled with all sorts of intriguing examples of “get involved” vegetables. Fava beans, new sweet spring corn, artichokes, and my personal favorite …spring green peas. Peas immediately rocket me back to my childhood. My grandmother loved to sit in her folding chair on our driveway on a sunny/chilly spring San Francisco afternoon, gazing out over an expanse of green painted cement that passed for lawn, a bowl of peas on her knee, chatting with me while we shelled for the evening’s dinner. She never minded if I stole a few from the shells I opened. Sweet and crunchy, they were better than candy. At least that’s what I was told. I believed her and fresh spring peas have always been a treat for me. Over the years I’ve used peas in all sorts of ways. I’ve served them with mushrooms, pearl onions and butter at holiday dinners. I’ve strewn them over pasta primavera, I’ve stuffed them into samosas and I’ve made them into soup. And to my mind, nothing says Springtime better than chilled green pea and mint soup. 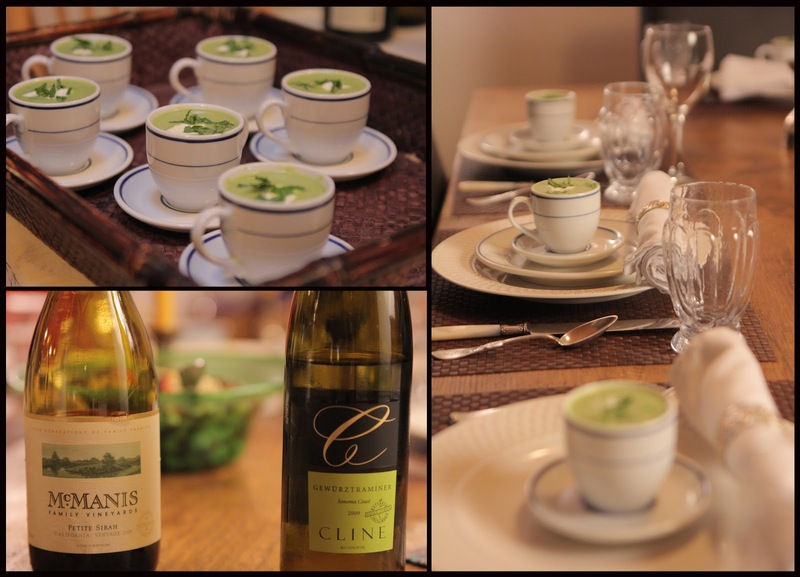 Last week, I threw my annual Springtime dinner and the first thing on the menu was pea soup. I served it in small cups as an amuse bouche , but of course a big bowl is always good too. The soup makes up very quickly, which is a plus. It can be served hot or chilled and made ahead of time, another plus. And perhaps the biggest plus of all, the base of the soup can be made with either chicken broth, vegetable broth or plain water. Something to please everyone. If you haven’t heard of this delightful treat before, here’s my adaptation of the classic mint and pea Spring soup. This fast and easy pea soup runs either hot…or cold. In a pot melt the butter or heat the oil. When the oil is hot or the butter melted toss in the chopped shallot. Saute the shallots until they soften. Add in the broth or water. Add in the mint sprigs. Turn the heat down and simmer the peas until they’re tender about 5 minutes. When the peas are tender toss out the mint sprigs and puree the soup with an immersion blender or a blender or food processor. Mix in the cream if it’s being used. Serve garnished with a bit of creme fraiche and chopped mint. It sounds brilliant - reminds of of a vegetables dish we make in India (especially, in the state of UP) called 'Nimona'. Thicker version of the pea soup, is just divine when had with chappati (a flat bread). For some reason, I never liked peas - but I like them like this! Yum!!! The photos are so lovely, too! Always include vegetables in your diet to maintain your health. Thanks a lot for sharing that wonderful blog. Wow, that pea soup looks and sounds incredible. And what lovely photographs of it, too. You've out down yourself, Kathy!